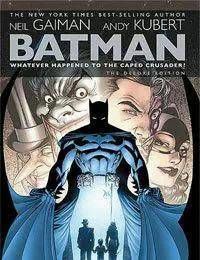 Best-selling author Neil Gaiman (THE SANDMAN) joins a murderers row of talented artists in lending his unique touch to the Batman mythos for this Deluxe Edition hardcover! Spotlighting the story Whatever Happened to the Caped Crusader? from BATMAN #685 and DETECTIVE COMICS #852 in which Gaiman joins artist Andy Kubert and inker Scott Williams for a story that shines a new light on the Batman mythos. Also collects Gaiman stories from SECRET ORIGINS #36, SECRET ORIGINS SPECIAL #1 and BATMAN BLACK AND WHITE #2. This collection is not to be missed!